CONSISTENT POWER WITH iAVR (INTELLIGENT AUTOMATIC VOLTAGE REGULATION) TECHNOLOGY: Honda's exclusive iAVR technology ensures a consistent flow of power regardless of the load. 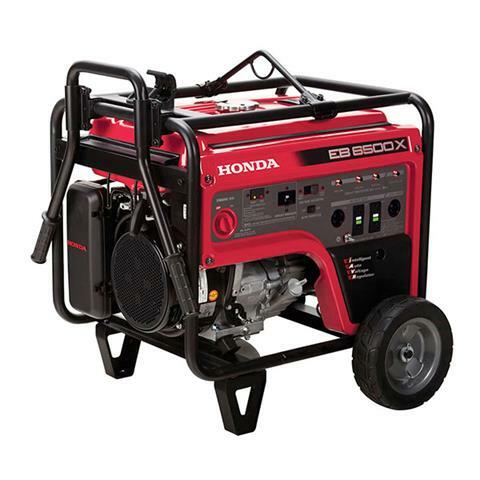 This translates into stable power for sensitive equipment and a more reliable power source for you. PROVIDES 7,000 WATTS FOR 10 SEC. 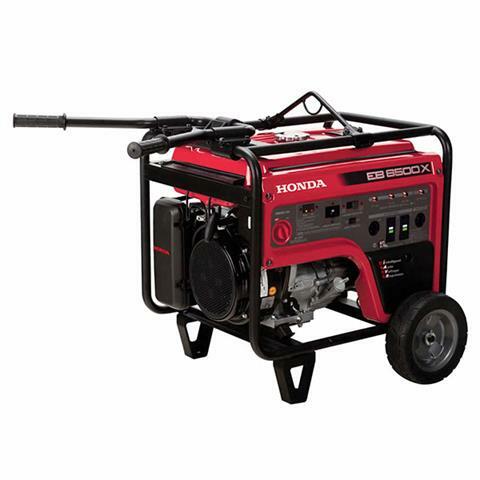 TO START LARGER EQUIPMENT: Honda exclusive iAVR technology lets the generator operate well above its maximum rating for up to 10 seconds to start high initial amp draw equipment. POWERFUL HONDA iGX COMMERCIAL ENGINE: Honda’s innovative iGX series engines deliver exactly what you’ve always wanted: reliable, optimal performance. These intelligent computer-controlled engines operate automatically with much better, simpler, and faster controls. RUNS APPROXIMATELY 10.4 HOURS @ 50% LOAD (6.2 GAL. ): Keeps you working, all day long. The EB6500 runs approximately 10.4 hours at half load and 6.9 hours at full load. EASY FOLDING HANDLES EASY FOLDING HANDLES: Wide, positive lock folding handles offer convenient transport and storage and a more compact unit. ALL CIRCUITS GFCI PROTECTED: The EB6500 offers neutral bond and full generator GFCI (Ground fault circuit protection) on all outlets. OSHA WORKSITE COMPLIANT: The EB6500 was designed to meet OSHA requirements, making it ideal for worksite applications. 6 OUTLETS FOR EASY CONNECTION OF MULTIPLE TOOLS. LOW 75 DB(A) SOUND LEVEL: Special muffler for quieter operation. iAVR Output - 7000W (58.3/29.2A) for 10 sec.